The Heart of Neolithic Orkney refers to a group of Neolithic monuments found in a harsh physical environment on the Scottish Orkney Islands. Maeshowe: a burial mound built on an artificial platform, with an interior passage and chambers. It is aligned so that the rear wall of its central chamber held up by a bracketed wall, is illuminated on the winter solstice. Maeshowe was looted by Vikings in about the 12th century. The more than thirty runic inscriptions they left behind on the walls of the chamber represent the largest single collection of such carvings in the world. Ring of Brodgar: a series of tall stones (originally 60, now 27 left) forming a circle of 104m diameter. The area also holds thirteen burial mounds. 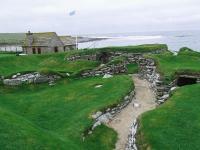 The 4th site, the neolithic village of Skara Brae, lies on the west coast of Mainland. This is a settlement composed of stone-built houses. It was rediscovered in 1850 after a fierce storm uncovered it. Ever since I encountered a group of “druids” dressing up at the parking lot of Stonehenge, I have a hard time taking these megalithic sites seriously. Especially the UK ones, as they seem to be surrounded by a mix of semi-religious revival and commercial exploitation more than others. However, Neolithic Orkney was still on my to do-list. This site comprises 4 locations: two stone circles (Ring of Brodgar and Standing Stones of Stennes), a burial mound (Maes Howe) and the remains of a village (Skara Brae). All are located not far from each other on the Orkney island of Mainland. I was tempting the logistical odds by visiting Mainland including this WHS on a weekend trip from my home. I flew to Inverness on Friday evening and returned Sunday evening. It’s a loooong commute and of course it would be better to take more time. But I managed to tick off the WHS and see some particular features of the Scottish highlands and Orkney as well. I started out from Inverness at 7.15 am on Saturday morning. There’s a bus that connects with the ferry to Orkney from John O’Groats. The bus ride in itself is a tour already, as it comes with a guide. On the Orkney side a bus is waiting to take you up to Kirkwall and even to do a full tour of the island. I had only booked to Kirkwall, rather wanting to see things on my own speed. The tourbus was quite cramped and came with a “funny” guide, which can get on your nerves after some time. From Kirkwall where I was staying overnight I had planned to take the 2pm T11 bus, that connects Kirkwall with Skara Brae and the Ring of Brodgar. This is the most efficient way for an individual traveller to see the main sites. However, at a quarter to 2 there were already so many people waiting at the bus stand that we would never fit into one bus. I decided to go and find a taxi, which also turned into a bit of a quest because a huge German cruise ship had taken over the town and the capacity of its taxi companies. Fortunately I found a female driver near the church, and she took me to the Ring of Brodgar in about half an hour. From there I would continue by public transport. The Ring of Brodgar is a large stone circle, located on an narrow isthmus between two “lochs”. With over 100m in diameter and a ditch around it, it is an imposing sight even from a distance. There’s no entrance fee taken or any other visitor information given, which is questionable given the importance of the site and the number of visitors. A foot path leads you along the circle, and you can get up and close with the stones (people do touch and hug them). From the Ring another path through the fields leads you to the Stones of Stenness, another and even older stone circle some 15 minutes away. It has the remains of a hearth at the center - which is about the only point of interest that I can name about it. After that I had planned to go to Skara Brae, probably the most interesting part of this WHS. But there were no taxi’s available, and the hourly bus had just gone. I couldn’t get any data om my phone so I couldn’t check for alternative options (or the opening hours of Skara Brae). Reluctantly I had to give up and return to Kirkwall. From the bus I had a glance at Maes Howe (the 3rd component of the WHS). This is only visitable by a guided tour, which inconveniently starts at the Stenness visitor center another mile away and has to be booked in advance. In hindsight I could have done better logistically. If you get stuck in Kirkwall like me, I think it would best to take a one way taxi to Skara Brae. After visiting that site, continue on foot to the Ring of Brodgar and the Stones of Stenness. It’s 5.5 miles on a straight road, so it seems walkable. 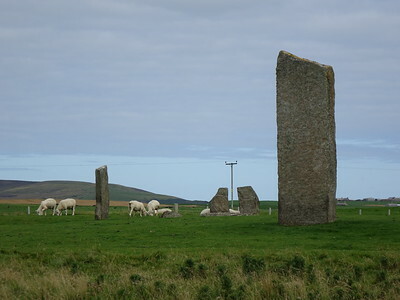 The Stones of Stenness lie at the main road between Kirkwall and Stromness - from there it is relatively easy to catch one of the hourly buses between the towns that run into the evening. There’s also an evening tour of Skara Brae which looks interesting, but that would be even more of a logistical nightmare by public transport. For over 25 years I have been traveling to World Heritage Sites around the world. This is a film about the Orkney Island north of Scotland (Swedish voice-over and English subtitles). Orkney Coaches run a fantastic service linking the four parts of the WHS with Stomness and Kirkwall. A day ticket cost 7 pounds, and I felt right at home on the bus (the driver was from Tasmania). I found the ancient dwellings at Skara Brae very intesting, but Maes Howe seemed a smaller version of the mound at Newgrange, Ireland. Connecting from the Scottish rail system to Kirkwall was made very simple with a return ticket costing 28 pounds, which covered the journey fron Thurso to Kirkwall via John O'Groats and Burwick and back again to Wick, in itself an interesting journey. I have made two trips to Orkney. It's a magical place. The neolithic sites of the Ring of Brogdar, the Standing Stones of Stenness, Maeshowe and Skara Brae are all wonderful. Part of the magic is that it's not over crowded. The rest of Orkney is worth visiting as well. St. Magnus Cathedral is fascinating. And the town of Stromness is more than a ferry port. South Ronaldsay, where my grandfather grew up is over the Churchill Barriers. You can visit the Italian Chapel which was done built by 20th century POWs. There are many jewelry designers and other artists on the island. Go to Hoy to say a more wild place than Orkney's mainland. You can see towers that were built for defense during the Napoleonic Wars. From near Longhope you can look back over the Pentland Firth to the mainland of Scotland. Read George Mackay Brown's stories to learn more about Orkney. My trip to the Orkney Islands was wonderful. I spent one full day and parts of two. With my friend I visited the Ring of Brodgar, the Maeshowe tomb, and the settlement of Skara Brae. All were very interesting. The ring is very large and can be walked around freely (unlike, say, Stonehenge). You can walk right up to the slabs. It's right off the road. The tomb is awe-inspiring. The space is maybe 15'x15'x15'. It is pretty completely dark except for the light from the guide's torch (flashlight for us Americans). My friend and I were the only folks in the tomb with the guide, and it was all the better for it. Not only do you get a 5000-year old stone tomb that took a hundred thousand man hours to build, but you also get a collection of 11th century Viking graffiti, too. The tomb is in a grass mound a short way from the road; you must buy a ticket (I think it was 10 quid) at the converted farmhouse opposite. And the settlement is the most beautiful. Set right by the ocean, it is a sprawling area of holes in the ground, surrounded by rocks, and with some treasures inside. You can actually see a 5000-year old "stone dresser", which is clearly a shelving unit built out of rock for the room's inhabitants. It's still standing. On a nice day this is a really wonderful place to be. Another 5 or 10 quid. On T List as "Mainland Orkney"
Archaeological potential: "together with a number of unexcavated burial, ceremonial and settlement sites"
Oldest Buildings: 3180 -2500BC - Skara Brae "A stone-built Neolithic settlement, ... It consists of eight clustered houses, and was occupied from roughly 3180-2500BC. Europe's most complete Neolithic village" (Wiki) "Because nothing survived of Skara Brae's roof structures, we must assume that they were made of a perishable, organic material - whalebone or driftwood beams supporting a roof of turf, skins, thatched seaweed or straw"
Historical Graffiti: Maes Howe: "The 30 inscriptions found in Maeshowe, make it one of the largest, and most famous, collections of runes known in Europe"
Writing systems: Maes Howe - one of the largest, and most famous, collections of runes known in Europe.